If you haven’t seen the original film Heathers, you must. Heathers is one of the most unapologetic and brilliant looks at “mean girl” culture in high school, and it follows a group of popular girls, all named Heather. Now, Deadline announced that Heathers star Shannen Doherty returns for the TV Land remake. That is VERY exciting news. Shannen played Heather Duke, the quieter and more bookish Heather. TV Land is remaking the film as a darkly comedic TV show. The pilot is shooting now, and if the show gets picked up for a full season, it will likely air in 2017. Shannen Doherty announced her return to the franchise with this behind-the-scenes photo, and we are SO excited. We’re not totally sure of the details of Shannen’s character in the new show. But Deadline suggests that she’ll be playing a “pivotal character” in the pilot, which has definitely got us eager to know more. This picture doesn’t tell us too much, but Shannen is wearing THE scrunchie. In the original Heathers, that red scrunchie acted as a status symbol of sorts, passed between the Heathers. So, the fact that Shannen is rocking it definitely means something, and we can’t wait to find out what that is. It’s amazing how far Shannen Doherty (and high school fashion) has come since her Heathers days. The original film was released in 1988. The new series will be updated for the modern day with a new, but equally vicious group of Heathers. 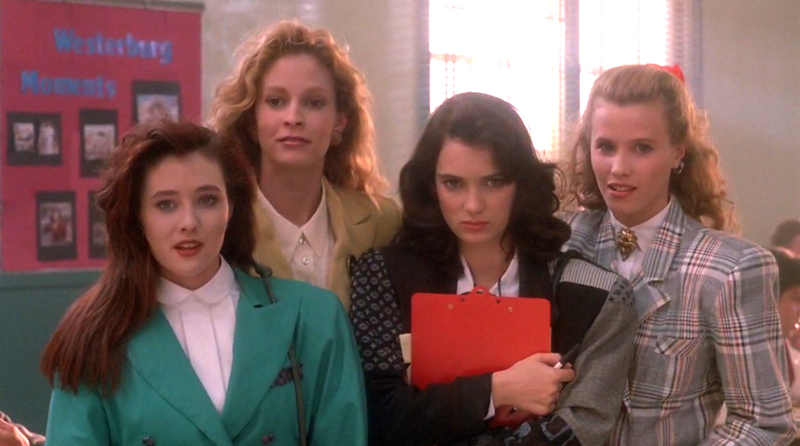 We can’t wait to see what new drama Heathers the TV show has in store!